Note: The type "405-1" family of dual-mounting arms (cross-arms) shown on this page is available only until stocks are exhausted. Equivalent functionality can be realised using two of our new type "415" side-arms which have the added ability to mount to a much wider range of mast/pole/tower sizes/shapes. A dual-mounting arm (also known as a cross-arm) is a convenient method of mounting both windspeed and direction sensors on one mast top. The close proximity of anemometer and windvane when mounted on a dual-mounting arm can affect the accuracy of the measurement, so for high-precision applications (e.g. 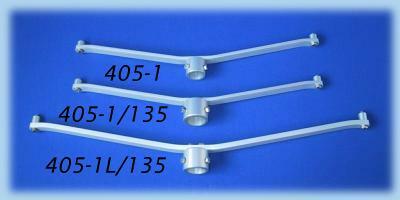 wind assessment) we recommend that only our 405 single-mount or side-arms/booms are used in those cases. The 405-1 uses a similar top fitting to the 405 single instrument mount, but includes a dual mounting arm with attachment points for an anemometer and windvane at either end giving a 500mm spacing between them. Note that there will be a degree of "shading" of the instruments for some wind directions (i.e. one instrument can interfere with the wind flow before it reaches the other) and there is a longer version (with 600mm instrument spacing), the 405-1L, which reduces this effect (and should always be used for mounting the larger SRW1G windvane). 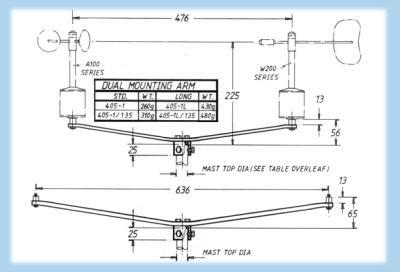 405-1/135 and 405-1L/135 versions of these mountings are available for both which have a larger top-fitting, which (like the 405/135 single mount variant) will fit over a 1.35" diameter mast/pole (i.e. 1" BSP). Other sizes and custom top-fittings are available to fit other mast top dimensions (please enquire). Note that a 405-OM mount can be used to mount a T351 series temperature sensor to the centre of a 405-1 or 405-1/135 cross-arm. Page Rendered in: 0.273603 seconds. - Powered by Mambo.